Just wait for the complaints to roll in. 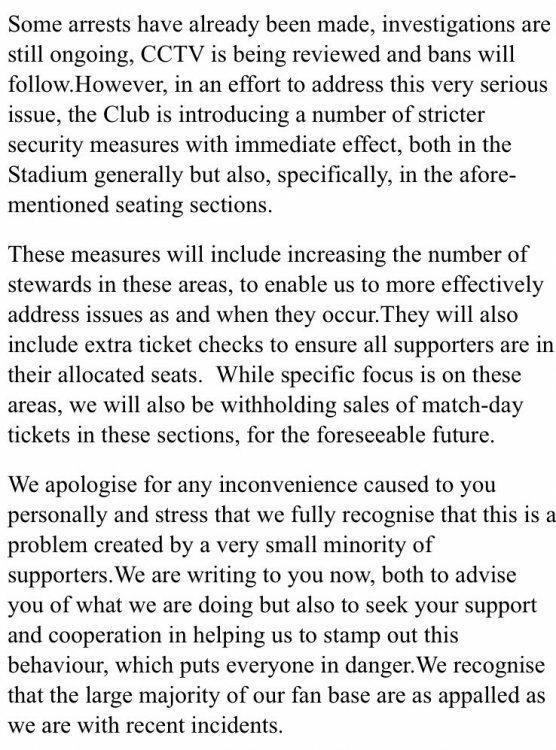 So costing the club in damage and potentially in lost ticket sales if we are selling out. Amazing work. Hard to disagree with it tbh. I’m all for passion and a bit of needle into the atmosphere, but throwing these things and coins is pretty much indefensible. The club has to be seen to be doing something. Unfortunately, the actions of a few impact many more. Good, that's a decent statement and fully justified. 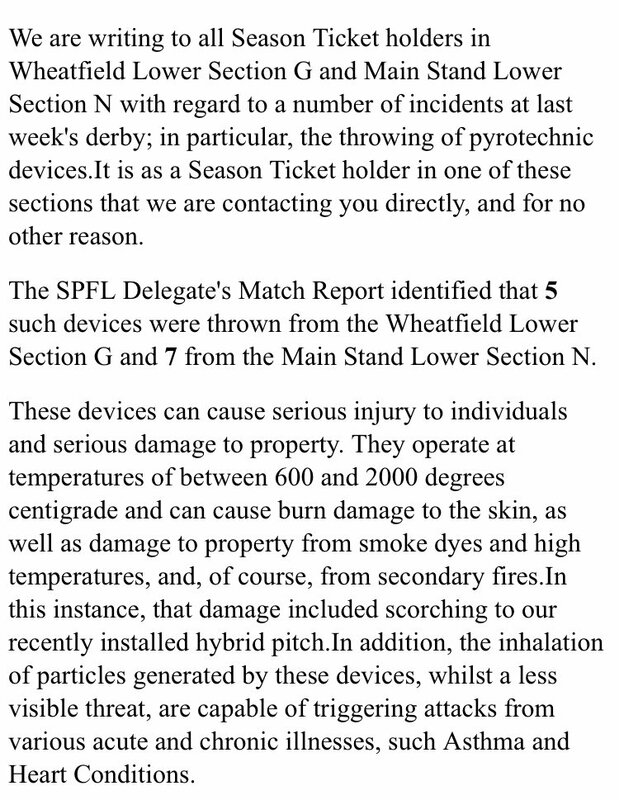 I'm intrigued though about CCTV and identifying people who throw items on the pitch. The people who threw these items and the Lennon coin thrower do not seem to have been identified using the tools at the police's disposal, the majority of them thrown from our new stand. Is there just a delay in identifying the individuals or is this a problem that needs resolved. Its everyone else rustling sweetie wrappers thats the problem. What do mean seen to be doing something. It's a disgrace if it's costing us money and the idiots need booting into touch. It's about time the club got heavy handed and if there's collateral damage you can't say you haven't been warned. I would advise the innocent to move seats as suggested. 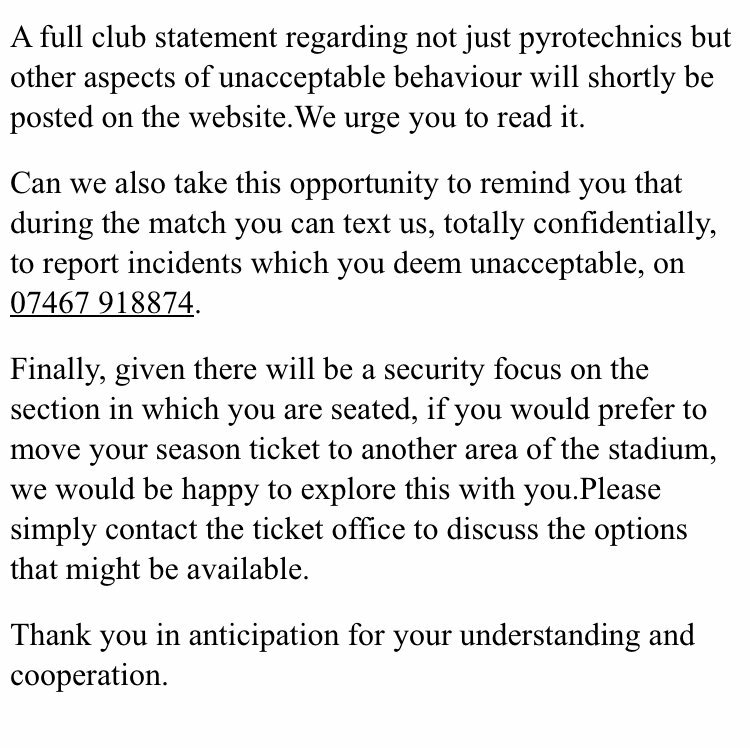 Well done Hearts, thats a nice strong email which was required to let this small group of fans know that you wont be putting up with any of thier crap. I hope our lovely new pitch isn’t being damaged by fuds wae fireworks. This forum is a joke. Not sure what that actuslly means in this context but what are your views on the club’s actions? Can u not just watch the fitbaw without acting like a halfwit. Time these neds were banned for life. They are using a sledgehammer to crack a nut. They clearly have CCTV in these areas and have identified and arrested individuals, can they not just do that and stop collectively punishing fans. At any other club in the league, there would be uproar that innocent fans are being targeted because they sit close to offenders. On here, it’s their own fault? That’s a joke. Tynecastle will be back to its library best, and people are delighted? I wonder what action Hibs will take? Bet you nothing like what we have. So if you’re sitting next to an idiot, you deserve to be harassed? Appropriate and necessary message. Fully back the club on this. You can't afford to sit next to me. I’m sure there will be some uproar from thise that sit in these sections. Has there been any more arrests than the two that were publicised? If not then better cctv is needed. The club will be under a lot of pressure from the police and authorities to do something sadly. Seriously though the club had to make that statement and the few idiots have probably spoiled it for the rest of us who like to stand at the games. Certainty we will all be sitting now. If you feel you are sat next to an idiot, the club has given you two options there, you can either move or, quite reasonably if you don’t feel you should have to move, report the idiot. If you take neither of those options and yet claim harassment, you have no real grounds beyond the playground ‘I’m no a grass’ defence. Punishing all fans because of the actions of a few idiots. Embarrassing from Budge. The club will be under a lot of pressure from the police and authorities to something sadly. Something does have to be done dave, we can all agree on that. How can it be fair to collectively target fans because they happen to be in an area where there are some individuals who can’t behave? It’s not our responsibility to police that, it’s the authorities. As a ST holder in N I worry that it’ll be a case of sit down and shut up though, while the away fans are able to stand and make an atmosphere. That is unacceptable. It says some arrests have been made so I assume it’s more than the 2. The club should invest in technology that photographs every individual as they enter the stadium via every turnstile and ties that image to the ticket presented using the bar code. The police should also take high resolution images of the crowd section by section. In the event of any incident then the use of that photographic information it should make it easier to identify any individuals involved. I’m not getting ‘punished’ in section C. Hardly all fans. It’s interesting that our support seems to have this mentality. It’s for the police to deal with, not the fans in the ground. My scenario is this - I like to stand and sing at the games, being in N allows me to do this. If I move to the Gorgie can I still do that? Folk trot out the ‘Tynecastle has the best atmosphere’ line constantly on here. Do you think that comes from guys sitting on their arses and only opening their mouths to moan at the players? No it’s some of these guys who folk think it’s ok to suffer ‘collateral danage’ who are getting behind the team. Why don’t you ask a player what they’d rather have? I imagine the corner sections in the Gorgie will be similarly ‘monitored’ in bigger matches. I’m not getting ‘punished’ in section C. Hardly all fans﻿. Preventing walk up fans buying tickets in two of the most atmospheric sections of the ground is unnecessary. They definitely would rather that folk that throw stuff weren’t there I imagine. Great post. Hearts fans suffer because the Police can't do their job properly. You don’t throw the baby out with bath water though Dave. Deal with the maximum of 15-20 involved and leave the rest of us alone to back the team. No other club in the league would act in this way, which is a pretty sad indictment. Well done lads. Costing the club money because you can't behave. Bet you are proud of yourself. Firstly, you're not supposed to stand, that's why you're provided with a seat. If there was a brain cell amongst you, you'd realise you were being cut some slack and a blind eye was being turned. Unfortunately a good few have taken the piss and ruined it for the rest of you, that's not the club's fault, that's your own stupid faults. You should be sitting whilst the game is on. If you want to stand whilst the game is on, and still watch it, best go to the pub. Unfortunately a good few have taken the piss﻿ and ruined it for the rest of you, that's not the club's﻿ fault, that's your own stupid faults. Fans of every club in the country stand at various games. Why should we be any different? I agree. You pay money to watch a game, not police people around you. The statement, rightly, says CCTV is being used and bans are coming. Well, do that and keep doing it people will get the message. To stop selling tickets in those areas is an extra measure that is not needed.....daft, in fact ! No it’s not, it’s common sense. We know we have troublemakers in those sections and need to identify them and ban them. Easier to do this with as few fans as possible in that area during a game. It is for the club to deal with, and they are. If you have a better solution, feel free to propose it. Nowhere in the ground allows you to stand, you may choose to stand and it may be tolerated, but it is not ‘allowed’. Finally, whenever the atmosphere is ‘special’ it is because either it’s a big game and the whole crowd are involved or because something else has happened, like poor refereeing or some other injustice, and the whole crowd is involved. If folk standing in G and N made for a great atmosphere, it would be like that every game. It isn’t. If I asked any of our players if they preferred my type of fan to yours, how many would pick yours? Horrible attitude that just means that all away teams would be as well having a home game when playing at Tynecastle. Or Hearts fans suffer because a few Hearts fans can’t behave and frequently break the law? A few smokebombs getting thrown by a handful of idiots is not reflective of a whole section. With the CCTV the police are meant to have it should be easy to identify and ban them. If you behaved there wouldn't be an issue.